For an easy and efficient way to control both electric light and daylight, look to GRAFIK Eye QS. Fully customizable, GRAFIK Eye QS adjusts lights and shades for any task or activity at the touch of a button. Control any load, from screw in LED bulbs to EcoSystem LED drivers, with premium dimming performance and no need for an additional interface. GRAFIK Eye QS allows you to meet your aesthetic, functional, and regulatory needs for any project or space. Create a simple standalone tunable white solution using GRAFIK Eye QS with integrated EcoSystem. Lutron and Lumenetix work together to optimize tunable white control integration using Lumenetix LED modules with built-in EcoSystem capability. 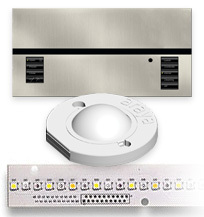 Lutron’s many independent fixture manufacturing partners can now deliver premium tunable white fixture solutions for any application and ensure high-quality tunable white performance and seamless integration with GRAFIK Eye QS. Design any space with the new manual or motorized roller shades. 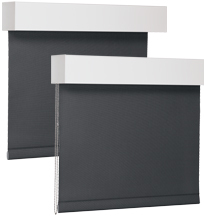 Available as standalone or fully automated with Hyperion solar adaptive technology, the motorized shades are low voltage and available with QS control to integrate seamless with Lutron lighting control systems. With the right performance fabric, Lutron Contract Roller shading solutions enhance aesthetics, reduce glare, maximize daylight, and preserve views.